A homegrown musician made a triumph return last Thursday night and put on a show to remember inside the Tom Karren gymnasium in Magrath. Trevor Panczak returned home to help celebrate Chautauqua 2016, Canada’s Mormon Trail. Panczak put on a memorable performance in front of a full house with a mix of cover songs and originals. Being back in Magrath is always a special feeling for Panczak and being able to entertain the people he grew up with is something he will never get tired of. The support Panczak has seen from the community over the years has been great and this time around was no different. “It showed itself tonight. The Tom Karren gym was full and that brought a big sense of pride to me. It couldn’t have gone any better as far as the crowd response and the amount of people in the bleachers,” said Panczak. Panczak is a top 12 finalist for Project Wild, a professional development program designed to educate, promote, develop and launch the careers of some of Alberta’s up and coming country and roots artists. Each artist will be awarded a $5,000 Development award and compete in a series of events. The winner of Project Wild will be awarded just over $100,000. They will all get the chance to compete in an intense and career changing music industry boot camp, where they will be pushed to the very limit of what they can achieve as artists. Something Panczak is looking forward to. “The people in it are great and a lot of the finalists I have known from the past as well. I am looking forward to learning about music law, meeting some key members of the country music scene as well as getting to hang out with some of these fellow Albertan country artists,” said Panczak. 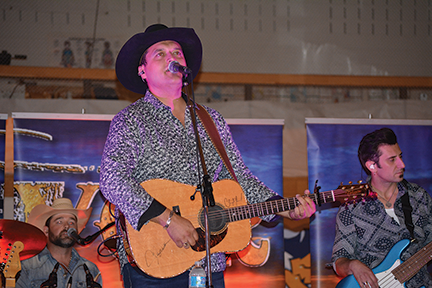 Prior to Panczak taking the stage in Magrath, there was an opening act that included Mario Argueta, Cassidy Cook and local band, Highway 62. Panczak says he was really impressed with the talent here in Magrath and felt blessed he got to follow some wonderful performances. Panczak has been working on an album this summer which has taken him to Nashville along with Salt Lake City and many different places in between. With Project Wild taking up a lot of his time, Panczak is hoping to release the album by spring of next year.